Offering you a complete choice of products which include d cut bag making machine, automatic non woven bag making machine, non woven bag making machine, non woven bag sealing machine, box type bag making machine and bag making machine. Fair print D Cut Bag Making Machine is the major break through of our engineers who passionately hunt for the best to stand us different in crowd. Wealth of Fair print lies in its passionate, knowledgeable & skilled people equipped with various modern technologies & giving innovative solutions, delivering continuous changes required by the customer. Bag Making Machine are extensively appreciated and recognized for their superior quality, reliability, efficiency and cost-cutting measure in India and Worldwide. Wide range of Non-Woven Bag Making Machines can make bags with D-Cut, without D-Cut, Vest Type Bags with Side Gusset etc. We also have fully automatic Non-Woven Bag Making Machine with Online Handle Sealing. On-Line U-cut for Vest Bags & 3-D Box Type Bag are also available. Non-Woven Bag Making Machine is extremely suitable for big volumes and results in fast turn around. Advanced Technology Control Panel with Touch Screen allows easy customer interface resulting in good quality & consistent output. Fair print Automatic Non Woven Bag Making Machine is the major break through of our engineers who passionately hunt for the best to stand us different in crowd. Wealth of Fair print lies in its passionate, knowledgeable & skilled people equipped with various modern technologies & giving innovative solutions, delivering continuous changes required by the customer. Bag Making Machine are extensively appreciated and recognized for their superior quality, reliability, efficiency and cost-cutting measure in India and Worldwide. Wide range of Non-Woven Bag Making Machines can make bags with D-Cut, without D-Cut, Vest Type Bags with Side Gusset etc. We also have fully automatic Non-Woven Bag Making Machine with Online Handle Sealing. On-Line U-cut for Vest Bags & 3-D Box Type Bag are also available. Automatic Non-Woven Bag Making Machine is extremely suitable for big volumes and results in fast turn around. Advanced Technology Control Panel with Touch Screen allows easy customer interface resulting in good quality & consistent output. We are a highly acclaimed company in offering Non Woven Bag Sealing Machine to our clients. This product is known across the globe for its strong construction and easy operation. We manufacture this product using premium quality of metals procured from renowned vendors of the market. This product can seal variety of non woven bags like clothing bags, reticules and shopping bags of various sizes and shapes. Bag Making Machine is a breakthrough modern Design to deliver Diverse needs of Worldwide Consumers for heavy production at very economical running cost. U-Cut Bag Making Machine is a breakthrough modern Design to deliver Diverse needs of Worldwide Consumers for heavy production at very economical running cost. U-Cut Bag Making Machine is suitable for Mass volumes and results in fast turnaround. Fully Automatic Box Type Bag Making Machine is a breakthrough modern Design to deliver Diverse needs of Worldwide Consumers for heavy production at very economical running cost. Fully Automatic Bag Making Machine is a breakthrough modern Design to deliver Diverse needs of Worldwide Consumers for heavy production at very economical running cost. Fully Automatic Bag Making Machine is suitable for Mass volumes and results in fast turnaround. Non Woven Bag Making Setup is a breakthrough modern Design to deliver Diverse needs of Worldwide Consumers for heavy production at very economical running cost. Non Woven Bag Making Setup is suitable for Mass volumes and results in fast turnaround. Non Woven Setup is a breakthrough modern Design to deliver Diverse needs of Worldwide Consumers for heavy production at very economical running cost. Wide range of Non-Woven Bag Making Machine is suitable to make bags with D-Cut, without D-Cut, U-Cut / Vest Type Bags with Side Gusset etc. Optional features for On-Line Handle Loop Pasting, On-Line U-cut for Vest Bags 3-D Box Type Bag are also available. Non Woven Setup is suitable for Mass volumes and results in fast turnaround. Advance Technology PLC controlled Touch Screen Panel allows customer for Managing the machine parameters easily thus helping in good quality consistent output. Box Type Non Woven Bag Making Machine is a breakthrough modern Design to deliver Diverse needs of Worldwide Consumers for heavy production at very economical running cost. Box Type Non Woven Bag Making Machine is suitable for Mass volumes and results in fast turnaround. Non Woven Bag Making Machine is a Breakthru' modern Design to deliver Diverse needs of Worldwide Consumers for heavy production at very economical running cost. Non-Woven Bag Making Machine is suitable for Mass volumes and results in fast turnaround. Automatic Bag Sealing Machine is a breakthrough modern Design to deliver Diverse needs of Worldwide Consumers for heavy production at very economical running cost. 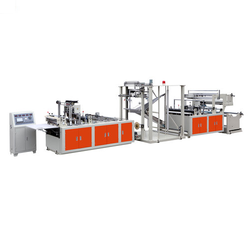 Automatic Bag Sealing Machine is suitable for Mass volumes and results in fast turnaround. T-Shirt Bag Making Machine is a breakthrough modern Design to deliver Diverse needs of Worldwide Consumers for heavy production at very economical running cost. Automatic Non Woven Box Bag Making Machine With On Line Handle is a breakthrough modern Design to deliver Diverse needs of Worldwide Consumers for heavy production at very economical running cost. Automatic Non Woven Box Bag Making Machine With On Line Handle is suitable for Mass volumes and results in fast turnaround. Fully Automatic Non Woven Bag Making Machine is a breakthrough modern Design to deliver Diverse needs of Worldwide Consumers for heavy production at very economical running cost. Fully Automatic Non Woven Bag Making Machine is suitable for Mass volumes and results in fast turnaround. Automatic Bag Making Machine is a breakthrough modern Design to deliver Diverse needs of Worldwide Consumers for heavy production at very economical running cost. Automatic Bag Making Machine is suitable for Mass volumes and results in fast turnaround. Automatic Carry Bag Making Machine is a breakthrough modern Design to deliver Diverse needs of Worldwide Consumers for heavy production at very economical running cost. Automatic Carry Bag Making Machine is suitable for Mass volumes and results in fast turnaround. Non Woven Pouch Making Machine is a breakthrough modern Design to deliver Diverse needs of Worldwide Consumers for heavy production at very economical running cost. Non Woven Pouch Making Machine is suitable for Mass volumes and results in fast turnaround. D Cut Non Woven Bag Making Machine is a breakthrough modern Design to deliver Diverse needs of Worldwide Consumers for heavy production at very economical running cost. D Cut Non Woven Bag Making Machine is suitable for Mass volumes and results in fast turnaround.